You can now view the Club’s Weather Station from your iphone or Android compatable mobile phones. I am looking to do a Duty Officer Swap for 8th May, as I will be away at a K6 Open event. Hi all just a quick update. Following what can only be described as a champaine sailing weekend it was awsome for me to see our Feva class not only on the water but racing and competing well done all who raced!!! Just a few quick things to think about with the worlds looming and continued training. Could all let me know if you think I have missed anyone as far as emails are concered as I lost the hard drive on my PC and have re generated the Feva email list but do not want to miss anyone. If any of you are interested in attending either the Nationals or Inland Nationals please let me know and even confirm please if you are not going. ALL CADET FAMILIES…Please find the Cadet Week Registration Pack attached. There is a lot of information and at least (depending on the number of children you have) 3-pages to print off and return to the club along with payment. Numbers are limited so advise haste! Wow! What a fabulous three days! 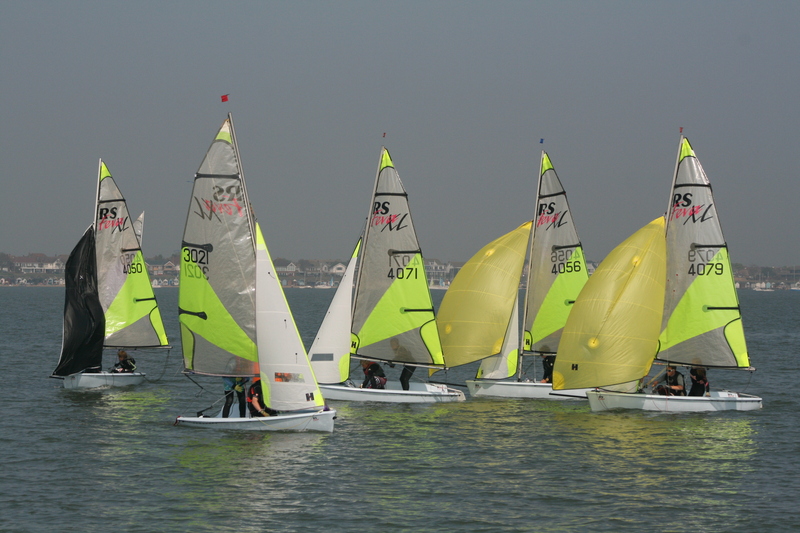 Many many thanks to Steve Hopper for organising such a great week for the Feva sailors. Having been on the Committee Boat on Monday and then again on Wednesday, the improvement in their sailing was amazing! The competition was very close and it was a joy to watch! Well done Feva sailors………bring on the Worlds! With the rise in numbers of privately owned power craft within the club and the enthusiasm for members to use them for following and supporting sailing activities, the General Committee have been asked to highlight the applicable club byelaw & suggest the following guidelines. A) To launch / recover outside of Dinghies launching / recovering from racing. This includes a period of 45 minutes prior to the published race start time to allow sailing dinghies clear access to the slipway & beach. B) Club Ribs to be given priority for launching & recovery as they are required to support Club activities. C) All ribs to be moored in such a way that does not prevent or hold up the launching of sailing dinghies. E) No towing of skiers, wakeboards or inflatables within the moorings area. F) When launching from the Club Slipway it is Club Policy that adequate Personal Buoyancy for all persons on board must be worn whilst afloat. G) In calm weather (under force 2) speed to be kept at a minimum if navigating in/around the racing fleet to avoid large wash.
H) Owners are solely responsible for ensuring they have adequate insurance coverage & are responsible for operation of the craft including if they have lent the craft to a third party. I) Owners to be aware that road vehicle drivers that have passed a UK driving test since 01st January 1997 may not be entitled to tow a trailer & boat combination over 750Kg. Please check directly with the DVLA. April is a busy month for the club and sees two great events in quick succession. Back by popular demand after last year is the Easter Hog Roast on Sunday April 24th. Tickets cost £12 for adults and £10 for children and include hog roast and all the trimmings and DJ. Last year over 250 people attended the Easter hog roast so get your tickets quick and be sure not to miss out! Then we have the Red, White and Blue back to the 80’s Royal Wedding Party on April 29th. It’s 30 years since some members saw Charles and Diana get married and now the next generation can enjoy their own royal wedding with Wills and Kate and celebrate in true TBYC style! Tickets cost £12 for adults and £10 for children and include full buffet and DJ from DNA Discos. This will be THE party of the year so get you tickets now and be sure not to miss it! We have a special discount for these two events. If tickets are bought for both events at the same time the buyer will receive a £4 discount which means adult tickets will be £10 each and child tickets £8. All tickets are on sale behind the bar now.